When you're in the manufacturing or production business, there occasionally comes a time that you need to store or move office furniture or other large fixtures. To maintain the value of those assets, it's always a good idea to keep them covered to avoid dirt, dust or other damage. 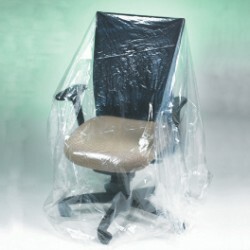 At eSupplyStore.com, we always have what your company needs to keep moving forward, including our selection of superior quality furniture covers. Our furniture covers are formed of 1 mil poly, so it is easy to work with. Available in quantities on a roll, we have sizes to fit virtually any large office furniture. Browse through the size chart below and select the sizes you need. At eSupplyStore.com, you'll always get the lowest prices on poly furniture covers and all of your essential shipping and warehouse supplies.